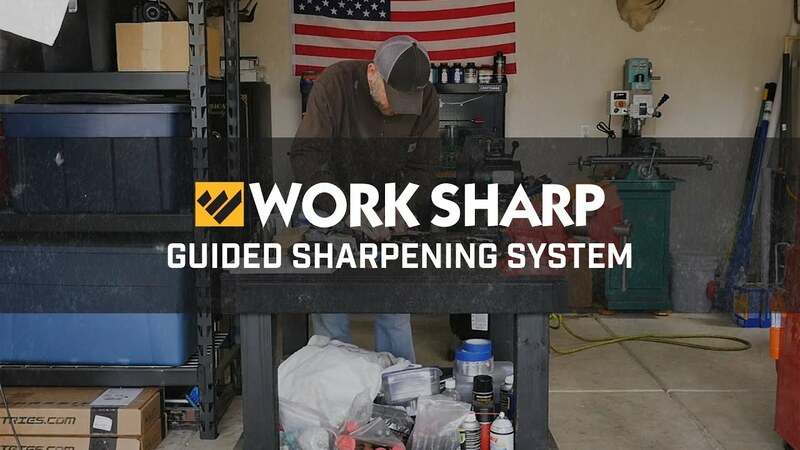 The Work Sharp Guided Sharpening System (WSGSS) was created with both novice and master sharpeners in mind and sharpens every knife you own. It features the innovative Pivot-Response System; which allows the abrasive to follow the curve of the knife while sharpening —making manual sharpening faster, easier and more precise than ever before. Quick change Diamond Plates and precision Angle Guides eliminate the set-up time and complexity associated with many other sharpeners. “The WSGSS features are driven by our customers “says Kyle Crawford, Work Sharp Brand manager. “We are fortunate to have very passionate and engaged customers who tell us what they want and need from their sharpeners.. I listen to them and incorporate their feedback so that Work Sharp can make better products that surprise and delight our customers.” The WSGSS puts an incredibly sharp and consistent edge on your pocket, hunting and kitchen knives, serrations, fish hooks, and many common edge tools. It helps teach novices to develop and master manual sharpening skills; while experienced sharpeners will appreciate the thought-out features that make this such a versatile and complete knife sharpening system. With the Guided Sharpening System, you have the choice of how you want to sharpen a knife, based on your skill level and the type of blade you want to sharpen. The Pivot-Response can be locked-out, creating a traditional sharpening surface or engaged to respond to the edge profile –without changing the sharpening motion. If you are new to sharpening or haven’t had success with sharpening stones, activating the Pivot-Response will do the work for you. It puts the skill in the tool rather than the user. “I developed the Pivot Response technology to teach anyone how to be successful when using a manual sharpener” says Dan Dovel, Work Sharp Design Engineer. “Many people want to use traditional sharpening stones, but struggle to maintain angle or get consistent results along the entire length of the blade. This sharpener will allow anyone to achieve those results and help them learn to be a proficient manual sharpener.” The WSGSS is a complete bench top and field sharpening solution for all your knives and common camp tools. The system comes with two Angle Guides (17° & 20°), interchangeable Coarse and Fine 6” Diamond Plates (320 and 600 grit), and an Angle-Guided Ceramic Hone that attaches to the sharpener, or stows in your pack for field carry.